Give your AR a sleek new look and add tactical versatility with this CBC AR-15 15" Hera Arms Keymod Handguard. Made from high-quality aluminum, this Handguard is built to withstand the hardest use and abuse of tactical and competitive shooting. 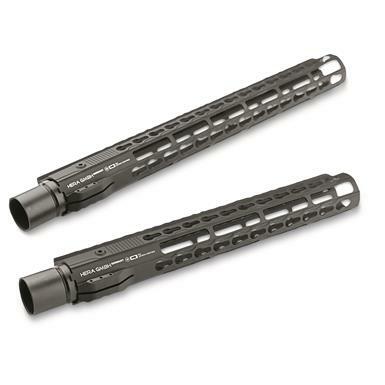 CBC Hera Arms AR-15 15 Keymod Handguard is rated 4.0 out of 5 by 2. Rated 5 out of 5 by Savannah River Cerakote from Solid as a rock As an 07 manufacturing business we need high quality products that appeal to our customers. You can spend a lot more but there is no need. Their finish is quality and we are cerakoting these on our custom builds. Rated 3 out of 5 by Jason from Ok handrail The handrail was ok. I don't think it is worth the price though. It came wrapped in plastic wrap, no box. As such, it has some dings in it. It just didn't look brand new. Luckily, it was going under the Cerakote gun so I was able to sand away and blast some of the imperfections and then cerakote it. So it looks great now. But, if I didn't have the Cerakote job, it would not have looked good. Hence, I don't think it is worth $127. For that price, it should be ready to go, no touch-up needed. It fits on the AR good though. One thing to do though is to maybe put a stop drill hole at the end of the cut where it clamps to the barrel nut. Mine started to crack there when I tightened the rail onto the barrel nut. A stop drill hole solved it, but I did it after it happened. If I would have known, I would have done it beforehand.